I would venture to say that most healthy upbringings involve some sort of journey into the spiritual world of the unknown. Whether it was clinging tightly to your group of friends as you nervously turned off the bathroom lights and chanted “Bloody Mary” in the mirror, got up the guts to walk onto the porch of the neighborhood “spooky house”, or even spent a night in a graveyard with candles and a Ouija board. Or…maybe I just had a particularly unhealthy obsession with the macabre as a youngster. All joking aside, I think most of us would agree that there was a point in our early teen years, perhaps earlier for some, where we became fascinated with what lies beyond. The history behind the Spirit board or Ouija board (as it has come to be known) is a fascinating one; from its beginnings in planchette writing in ancient China to its commercialization by Parker Brothers (later bought by Hasbro) in the late 1960’s, the controversial means of speaking to the dead have the makings of a movie written all over it. 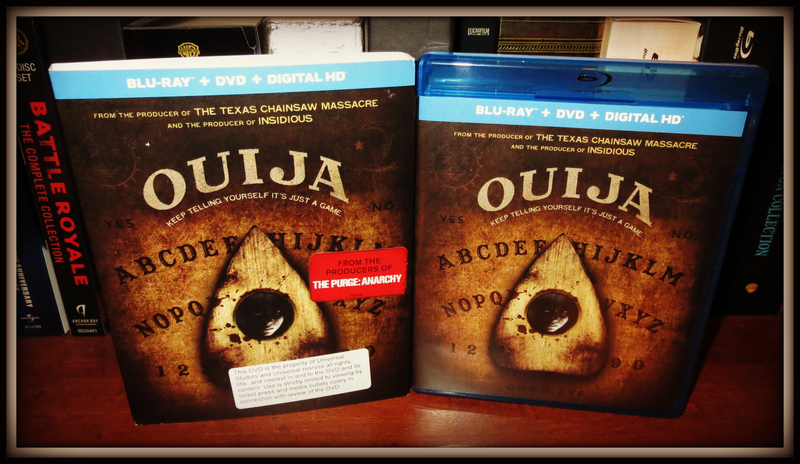 Though the concept had been explored before in films like The Exorcist and Witchboard, 2014’s Ouija from Director Stiles White goes all-out in exploiting the mysterious game on the big screen. Ouija stars Olivia Cooke as Laine Morris, a young woman whose best friend Debbie (Shelley Hennig) has just apparently committed suicide after using a Ouija board while home alone. Unconvinced that Debbie would ever harm herself in this fashion, Laine and her friends begin to investigate the mysterious nature of her death. They hold a séance in Debbie’s home, and appear to make contact with her, allowing some comfort within the group to finally let her rest in peace. But the terror has just begun. Soon Debbie and her friends begin to experience visions, scrawled messages, and other dire warnings that lead them to believe that they have awakened something in this house that refuses to rest until it can take more lives with it. I’ll be completely honest with you. I enjoyed the first half of Ouija quite a bit. 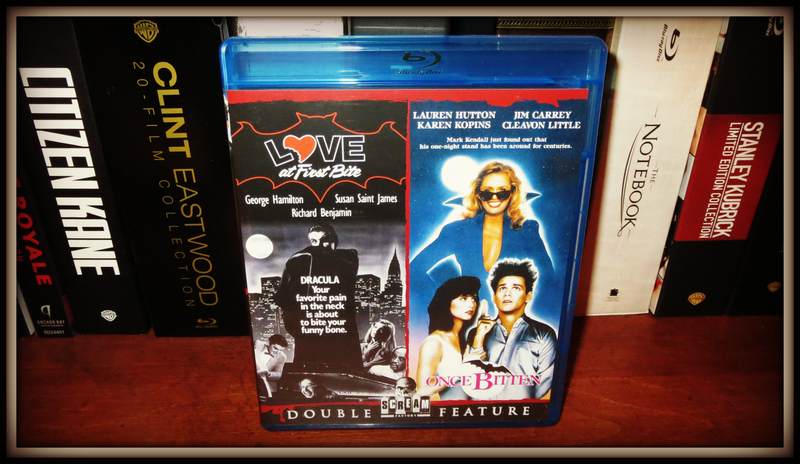 Though there was nothing particularly original about the film’s opening or subsequent ability to draw the viewer in, it simply unfolded in a way that reminded me of cheesy 90’s Horror; a group of college-aged kids, a mysterious object, an untimely death in the group that begs to be solved. It wasn’t much, but it surprisingly captured my interest. But any positive feelings I had quickly faded soon after, when the film ventured into territory that was all too familiar and easy. The potential to scare with a film centered on spirit boards is huge, but Ouija instead relies on jump scares and formulaic plot devices that are devoid of any true fear for the viewer. The cast does well enough with the material at hand, but stumbles more than occasionally with a script that doesn’t give them much to work with. Word on the street is that Ouija suffered from multiple reshoots and studio edits that left quite a bit of footage on the cutting room floor (much of which you can see in the trailer). Hope fully someday Universal will release an Extended Cut and allow Horror fans the opportunity to gauge any lost potential. 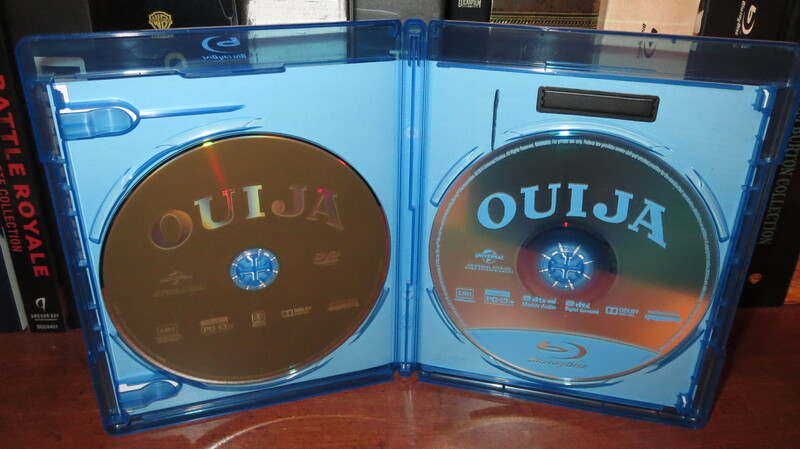 As usual, Universal has done a fine job on the video portion of this Blu-Ray edition of Ouija. The HD print features deep black levels, a remarkably clear and vibrant palette, and clarity that impresses throughout. 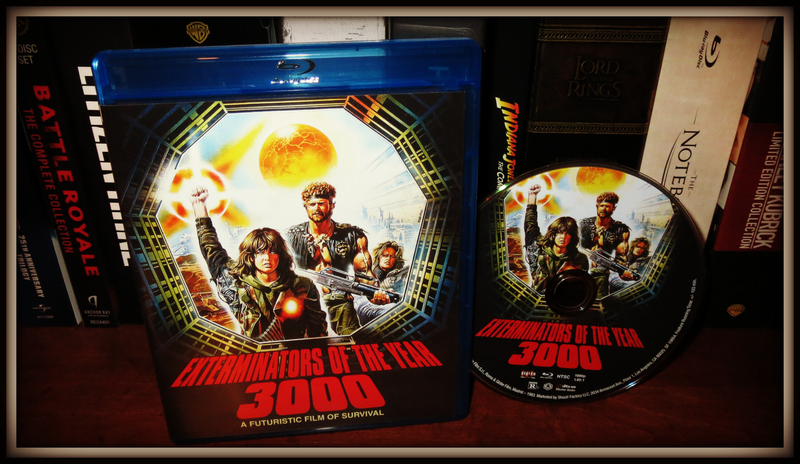 Though I didn’t care much for the film itself, this is a nice looking Blu-Ray disc. The 5.1 DTS-HD audio track included herein is a great example of great sound design for HD audio. The thrills and jump scares in the film (cheap as they are) work extremely well on this surround track, filling your living room with atmosphere. It’s the kind of audio track that will get you peeking up from under the covers fairly quickly. Well done! The Spirit Board: An Evolution- This roughly 4 minute featurette has the cast and crew discussing the titular board, its origins, and the horror elements they utilized during the making of the film. Adapting the Fear- This featurette runs just under 4 minutes and features the cast and crew discussing their personal history involving Ouija boards as well as stories they heard that inspired the screenwriting process. They also share some spooky moments that happened on set while filming. Icon of the Unknown- This featurette runs exactly 4 minutes and features some historians and experts discussing how the Ouija board works. 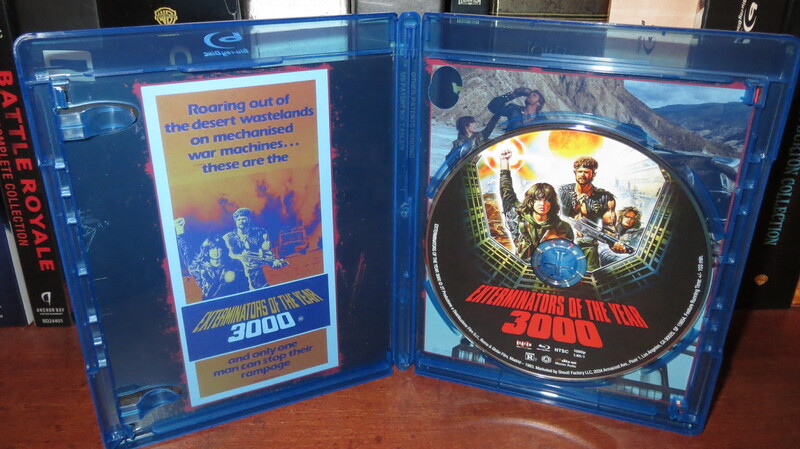 As you can see from the “Unboxing” pictures below, this Blu-Ray edition from Universal Studios Home Entertainment features a very nice matte finish slipcover complete with embossed logo. The design itself reminds one of the texture of an actual Ouija board, which is a nice touch. 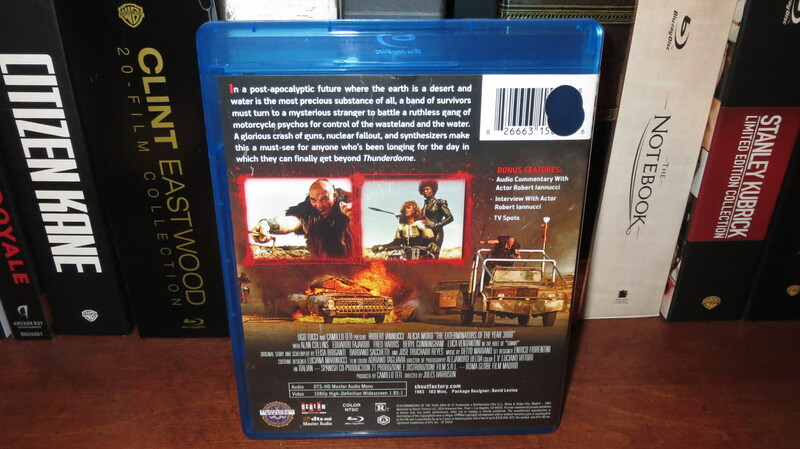 On the reverse of the packaging you’ll find a brief plot synopsis, a list of bonus features, technical specifications, and details regarding the Blu-Ray exclusives featured on this release. 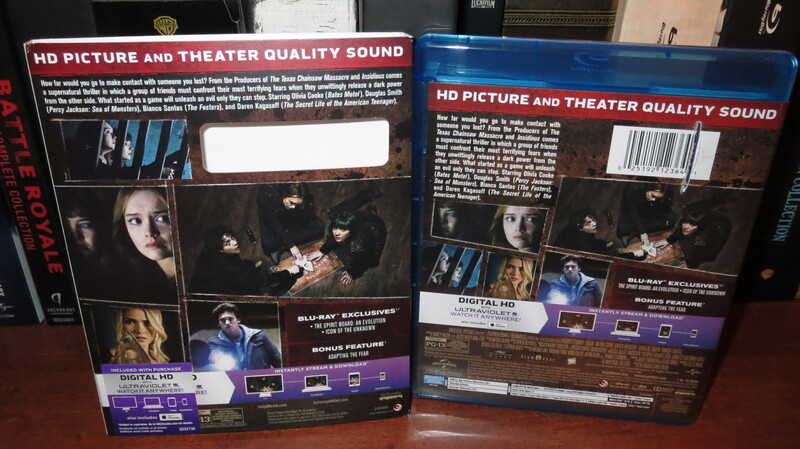 On the interior of the packaging are two fairly plain discs for the Blu-Ray and DVD as well as the Ultraviolet Digital Copy Code insert. 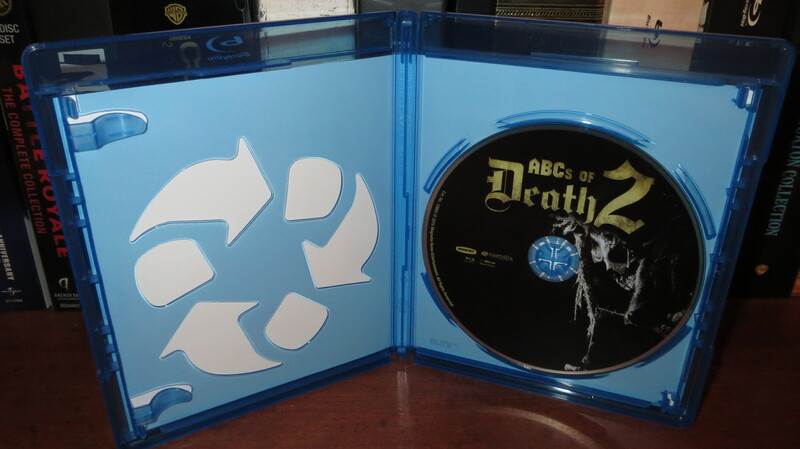 I would love to see Universal finally explore disc design options other than plain blue and silver. Growing up with a fascination of the spiritual realm and all things macabre, I enjoyed my fair share of dark and stormy nights with a Ouija board and lit candles with my group of friends. The very thought of a movie centered on the concept of spirit boards seemed very exciting. Unfortunately, Ouija falls apart with an uninspired script, cheap thrills, and nothing in particular to set it apart from the myriad of repetitive Horror films these days. The good news here is that the Blu-Ray from Universal Studios Home Entertainment features strong video and perfectly captured audio design on the disc. The special features are light at only 12 minutes total. If you’re like me and were looking forward to a Horror film that would finally get the world of Ouija right, this certainly isn’t it.